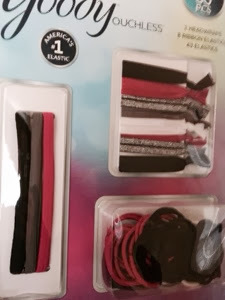 Last time my daughter visited, she asked me to pick up some hair elastics at Target. The small pack of elastics cost about three dollars. Not much, but enough to make the Goody large package, currently at my Costco, a good deal. Each package costs $9.99 and has 60 pieces, 3 head wraps, 8 ribbon elastics, and 49 elastics. My Costco has two color choices, one is shades of black, pink and gray, and one is more cheerful colors. I sent both to my daughter. That should last for a while.